The view of the front of the Greenhouses from Mishawaka Ave. The image above captures the essence of Winter in Northern Indiana fairly well. Overcast skies, snowy grounds, and very little color to speak of. Not to mention the bitter cold and wind that cuts through your layers of clothes. On days like this outside is not where most people want to be. Fortunately, we happened to be visiting South Bend, Indiana and had the opportunity to see some trees and color while staying warm inside. 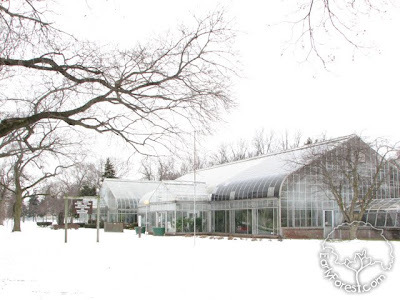 We entered at the Ella Morris Conservatory, one of several greenhouses that are linked together. The doors were locked tight, but a sign under a doorbell urged us to ring for entry. A woman promptly welcomed us and offered to assist us with any questions. 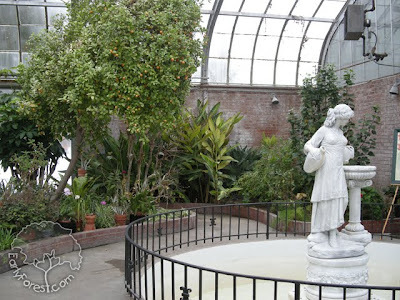 Inside the Ella Morris Conservatory we were immediately drawn toward a large Calamondin Citrus tree that had both fruit and flowers upon it. The woman working there offered to let us pick some fruit and try it. The little oranges had been sprayed with an insecticide, so I took them home and washed them first. They were very soft and sour, and only after researching them at home discovered that the orange colored fruit is often over ripe. 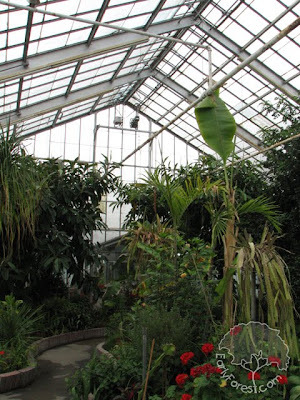 The Ella Morris Conservatory is one large open room with several large tropical trees with assorted undergrowth in the raised beds on each side of the path. 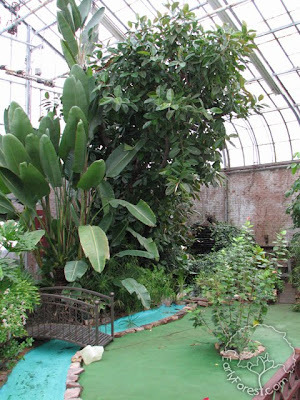 We passed under a couple of large Rubber Trees and entered the next room, The Muessel-Ellison Conservatory. 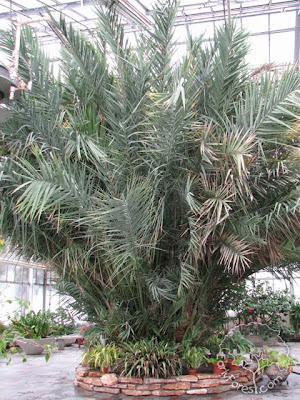 A large palm dominates the entrance to the Muessel-Ellison Conservatory. 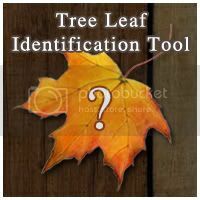 I was disappointed to find that most of the trees throughout the Conservatories and Greenhouses are without proper identification tags. Many do not have any name tags at all, and those that do often lack scientific nomenclature. 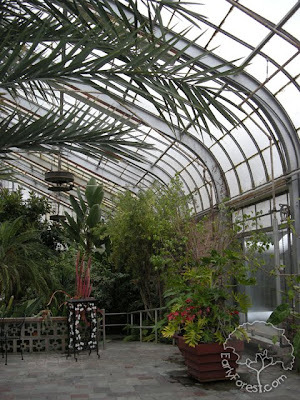 An upper terrace in the Muessel-Ellison Conservatory overlooks the gardens below. I was slightly disturbed by the artificial landscape inside the Muessel-Ellison conservatory. The green astro turf and blue creek begin to take on the character a minature golf course. 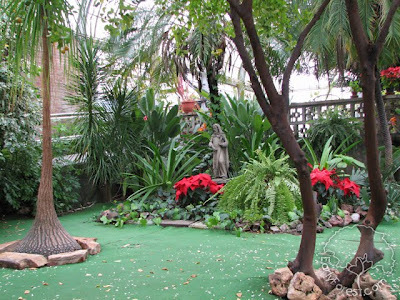 It is disappointing because the gardens have so much potential and with a little work could really shine. 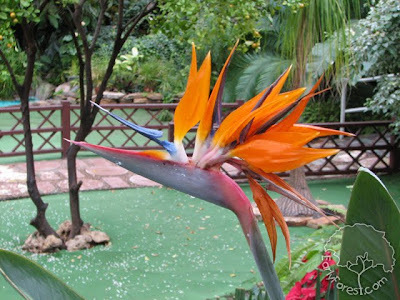 This beautiful Bird of Paradise flower was a welcome splash of color to brighten up our day. 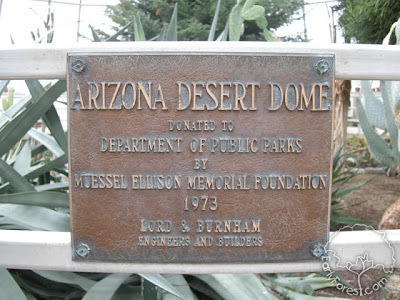 Moving on from the Muessel-Ellison Conservatory we entered the Arizona Desert Dome. The dome shaped building has a path that wraps around the exterior with the planted area in a depressed pit in the center. Kids will enjoy the acoustics of the room, the round walls create perfect echoes. 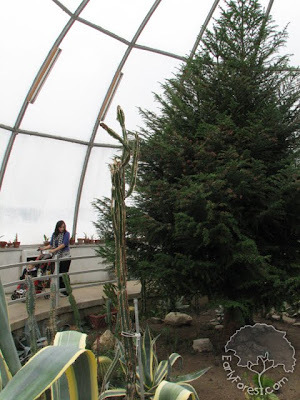 Visitors will find two large trees in the Desert Dome, a Monkey Puzzle Tree and a Pencil Tree. 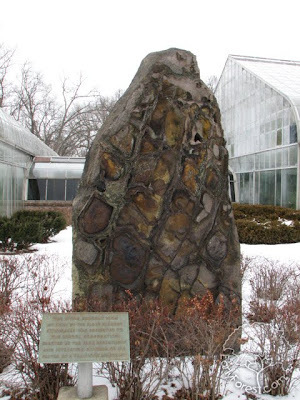 Just outside of the conservatories stands a tall stone. The plaque infront of the stone identifies it as a stone from Mt. Sinai. 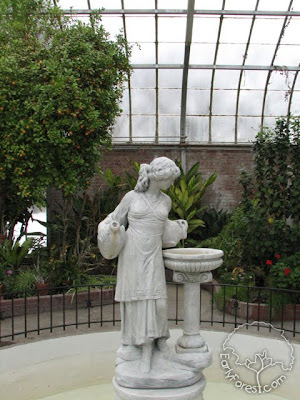 Our visit to the conservatories was a welcome escape from the winter blues. While the plant identification is lacking, the conservatories have huge potential that I am optimistic will be seen in the near future. I encourage you to visit the Botanical Society of South Bend's website where you can become a member and volunteer your time. To see some behind the sceanes photos of these Greenhouses, please jump over to our Facebook Page.